I saw it sitting in a chocolate box tucked on the bottom of a storage shelf in the back room of the vintage shop that I work part-time at. I assumed it was one of those rubber super bounce balls that I remembered from my childhood and gave no more thought to it. It wasn’t until a week later that I was drawn again to it and because it was a quite day at the shop, I indulged my curiosity, reached down and picked it up. I was pleasantly surprised to find that this 6cm (2 1/4″) emerald green ball was not rubber at all but cool shiny glass. Right then I had to own it. I knew my boss would sell it. It didn’t even rate high enough to be placed on a shelf for sale in the store but was rather consigned to a storage shelf in the back. Did it come in as part of a larger collection? A random item tucked into a boxed lot from an auction? It was not a usual item for our inventory. So for $4.00, pocket change really, I became the proud new owner of this green glass ball. I took it home, gently washed off the residue of an old sticker, buffed it dry with a soft cloth and placed it atop a crystal candle holder on my curio cabinet. I am not a nick-nack kind of person. I hate clutter. They say this is one of the signs that you are an Empath. I don’t know about that but what I do know is that my eyes prefer to rest on a visually calm space. For me to willingly bring an object into my home it has to resonate deeply in me somewhere. This little emerald orb does just that. You see, I have a secret desire. One that only my husband, and soon you, will know about. For some time now I have had a fascination with and therefore wish to covet my own, real, crystal ball. Cut to the scene of a dark haired gypsy women hovering over a 15-18cm (6 – 6 1/2″) globe of pure, clear, quartz crystal polished to a gleaming shine, perched on a elaborate metal stand of inter-twined dragons with glowing amber eyes. Yeah that’s the one I want. Crystal ball gazing is a lot like being mesmerized by the flickering flames of a crackling fire or the rippling images of the still reflecting pond. Your eyes seek a middle vision and your mind settles into a meditative state where your inner knowing can come forward. It is a divination tool. 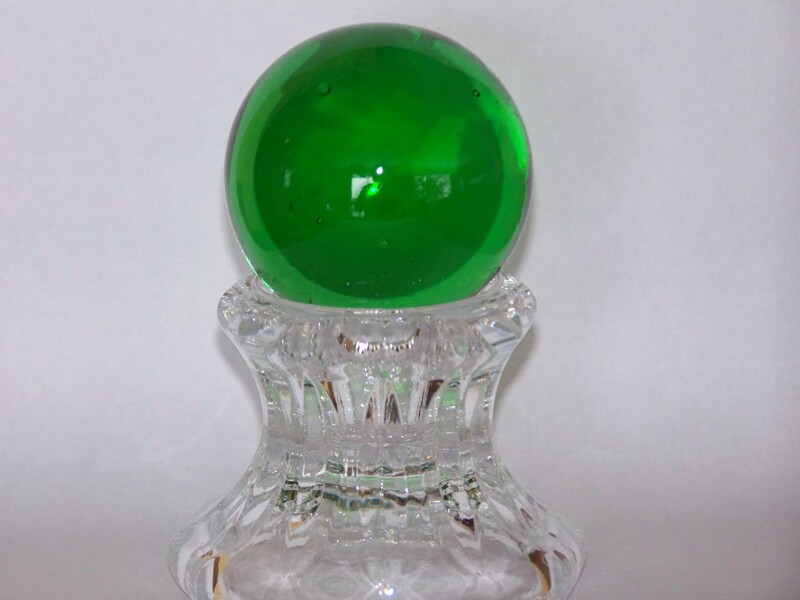 A true crystal ball, one formed out of solid quartz crystal can cost as much as $1500.00. The one I seek does at any rate so while it is high on “my desire” list, it is very low on my “do I really think this is a practical way to spend my money” list. In the meantime I fantasize about walking into a crystal shop where I find the prognosticating orb I seek with it’s price slashed 75% off or, that a mystic that I have yet to meet, bequeaths me his own personal crystal ball knowing that I am the best and only person worthy of such a gift. It could happen! Back in reality, this is where my green glass ball comes in. This little object represents a possibility. It is a symbol of my greater aspiration. When I gaze upon it, my desire for my true wish is continually renewed. This simple glass ball has a very important job. It must act as the stand in, the understudy. It must stoically maintain my longing for it’s replacement, the real star of the story, the gypsy inspired, wrapped in the great mystery, gateway to the unknown, solid quartz crystal ball. Not a bad gig for a $4.00 hunk of emerald green glass.